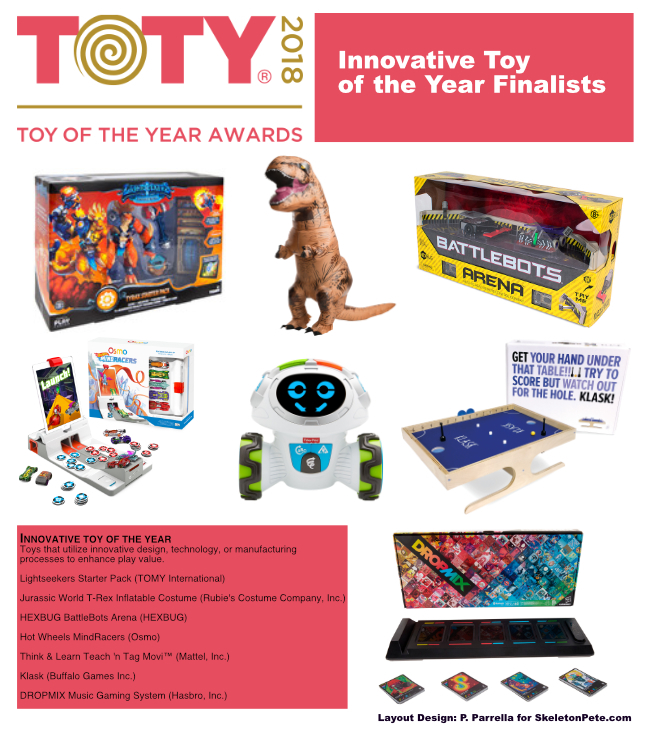 Right on time to usher in the gifting season, The Toy Association’s Toy of the Year 2018 (TOTY) finalists have been officially announced. 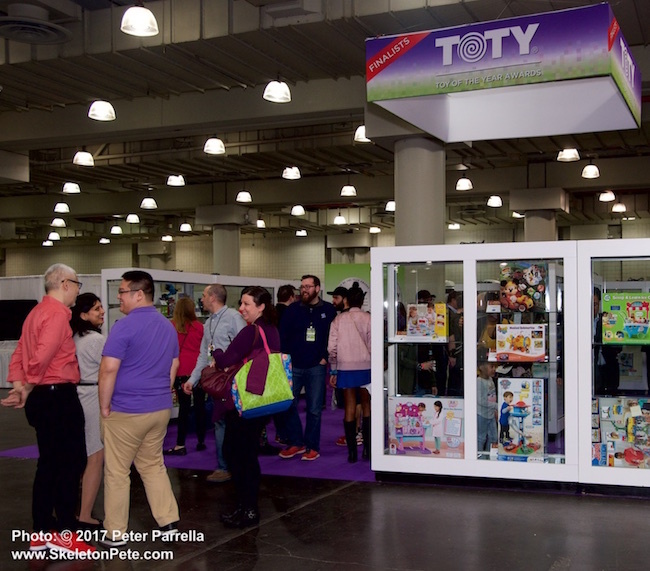 Speaking from the Toys “R” Us stage at New York’s Jacob Javit’s Center The Toy Association’s President and CEO Steve Pasierb opened voting for the top toy choices in 17 categories. Three new categories have been added this year. 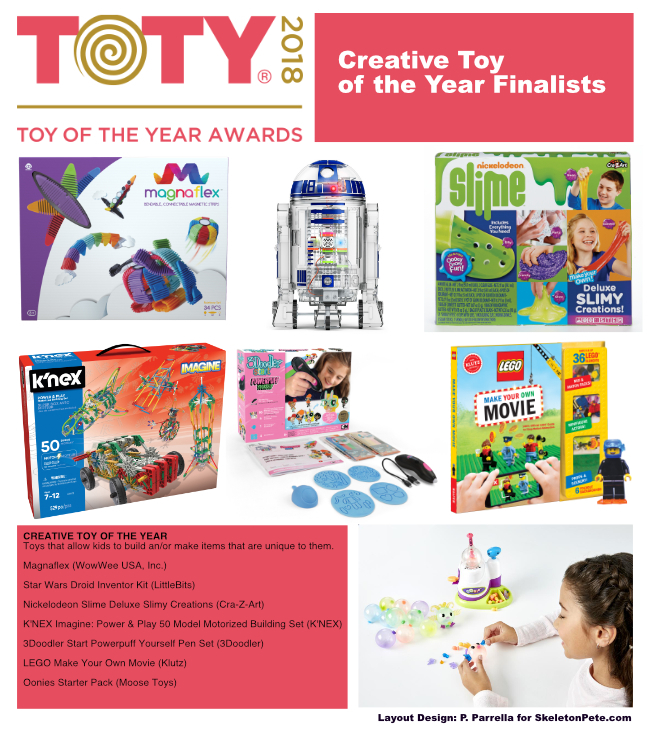 Creative Toy of the Year, Playset of the Year, and Plush of the Year join the mix for a total of 122 products in the running for best of the best. The TOTY announcement complimented a press preview for the Second Annual Play Fair family event. Following the opening statements by Pasierb and colleagues Ken Seiter, The Toy Association’s Executive Vice President, Marketing Communications and Richard Barry Executive Vice President, Global Chief Merchandising Officer for Toys R Us, attendees were guided to a special display section where the nominated products could be viewed and votes could be cast on-site via iPad stations. 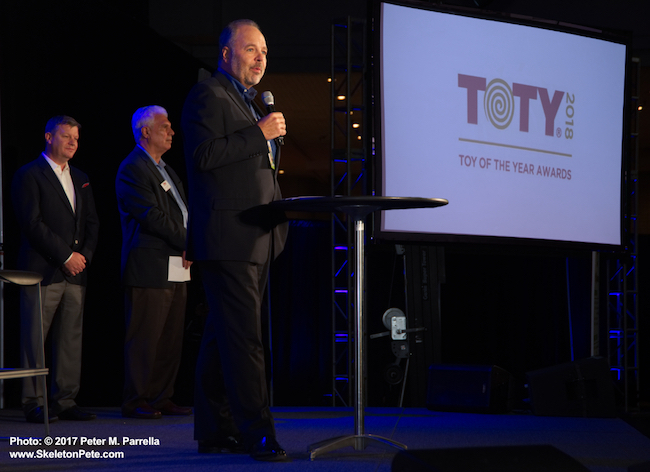 Toy Association President & CEO Steve Pasierb (center) along with Richard Barry Executive Vice President, Global Chief Merchandising Officer for Toys ‘R’ Us (Left) & Ken Seiter, Toy Association Executive Vice President, Marketing Communications, (right) opened voting for the 2018 Toy of the Year at a special Pre Play Fair Press Event. For over a century The Toy Association has advocated for the industry on many levels. The philanthropic Toy Industry Foundation, the standards developing PlaySafe.org and developmental and teaching initiative Genius of Play are all components of the association’s work. The Toy Halls of Fame at the Strong Museum highlight the history of play and beloved toys of the past. 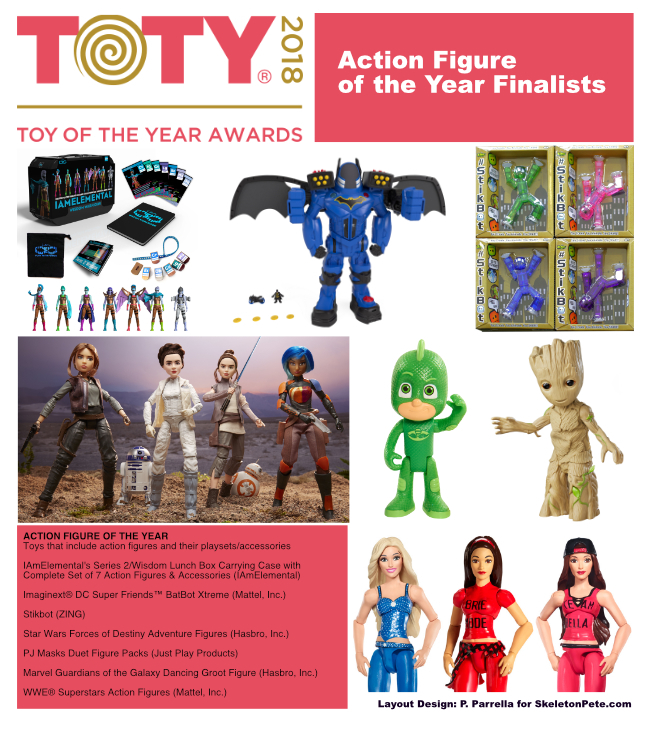 In addition to the separate category winners, the overall Toy of the Year and “People’s Choice” awardees will be named and toy industry trailblazers will be inducted into the Toy Industry Hall of Fame. Play Fair Press Preview attendees got a jump start on Toy of The Year voting. Toys that allow kids to build an/or make items that are unique to them. 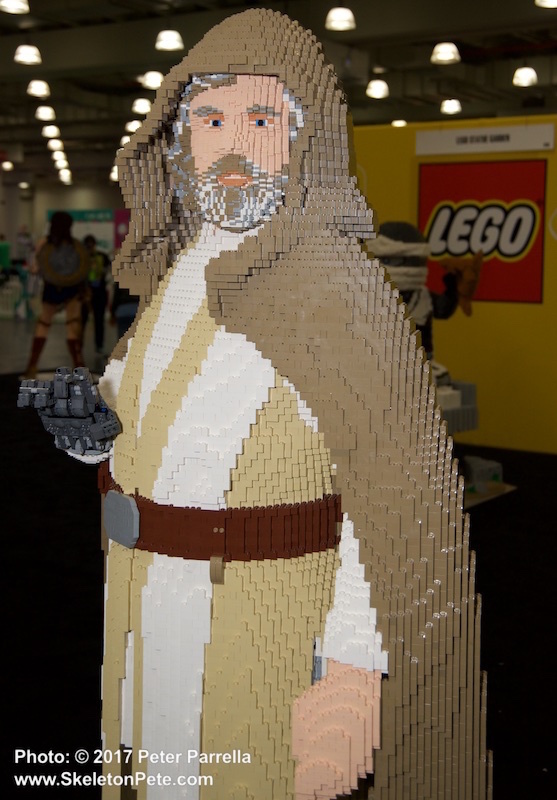 Luke Skywalker, The Last Jedi, is immortalized, larger-than-life, in LEGOS.